Other Comments: The Saxmen is a unique saxophone duo, featuring Leo Hall on alto sax and Vince Newton on tenor sax. That’s right, it’s just two men playing saxes, but with sound of an eight-piece combo! Their instrumental jazz, swing, Latin tunes and standards create energized and entertaining background music. The two saxes are self-accompanied by synthesized rhythm section, providing the sound of a large jazz group, but requiring only a fraction of the space and budget. For dancing, the Duo can be augmented by adding a female jazz vocalist. Musical selections include favorite hits of Frank Sinatra, Nat King Cole, and the music of Duke Ellington, George Gershwin, Cole Porter, Henry Mancini and many more. 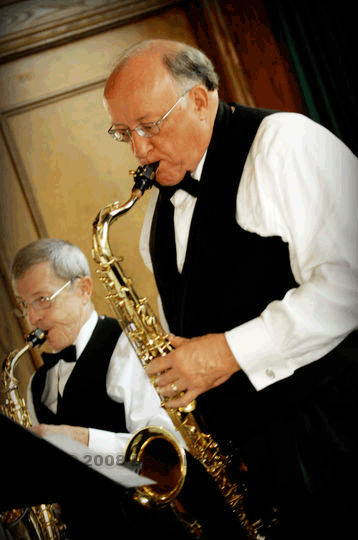 The Saxmen is a popular entertainment choice for parties, dances and fundraisers, as well as for enjoyable background music for cocktail parties and dinners.